**WARNING** Euphoric, endorphin-filled Tess on the loose. Post may contain unhealthy levels of running love. We all know that running is awesome. But what makes running even more awesome? Running with friends, that’s what. Today’s inaugural Bright10 was an exciting new addition to the Brighton race calendar, drawing a huge crowd and lots of noise on social media. 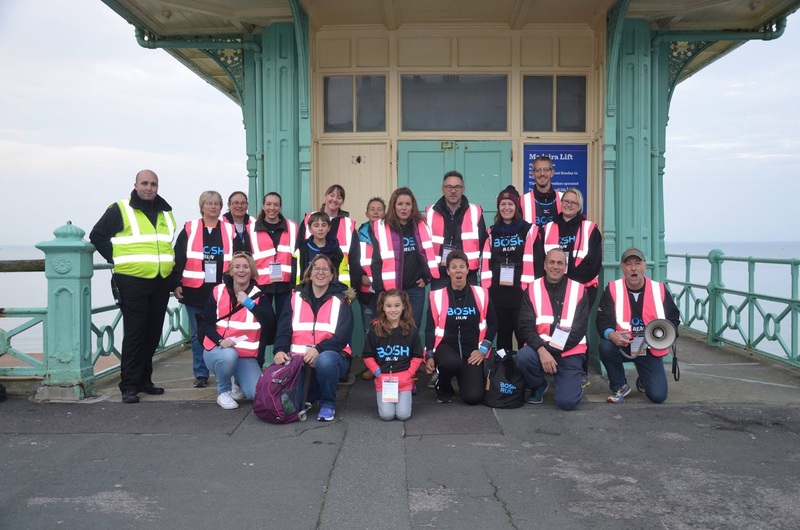 Mixed opinions have been aired about ‘yet another seafront run’, with some – me included – questioning why they’d pay to race a route they run in training almost daily. That question got answered for me today, and I’m hoping it did for many others too. 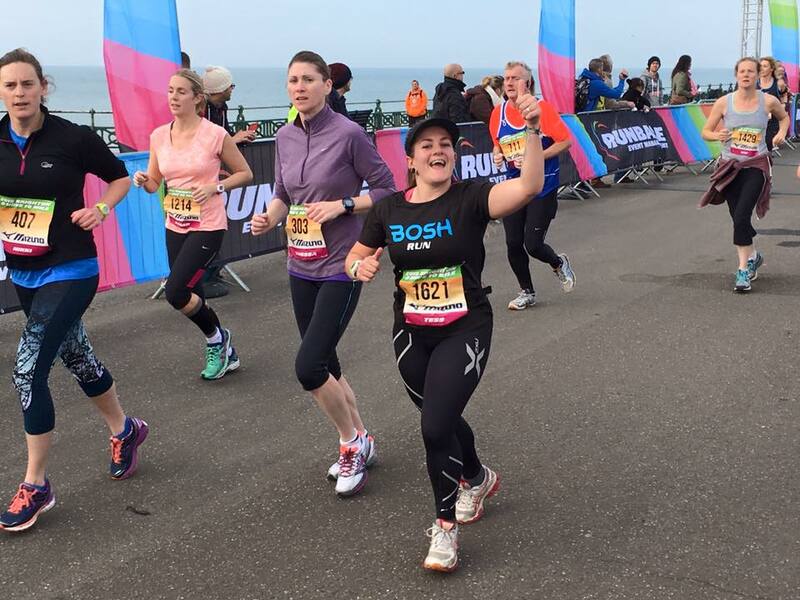 There are two reasons that make running in Brighton so special – the scenery, and the community. There really is nothing like running a race where every other person shouts your name, gives a thumbs up, screams ‘BOSH’, ‘come on’, or pushes you not to give up. When every mile you pass is accompanied by the cheers and praise from your ‘team mates’, on the sidelines, and alongside you on the course. When you’re overtaken by your peers, but then they stay at the finish line to watch you cross. And then feed you cake. All the cake. BOSH tent – CAKE!!! We raised £166 for the Stroke Association. Brighton is awesome, running is awesome, but people are magic. To be part of so many amazing support networks and friendship groups across various ‘families’, clubs and communities is just priceless – you can’t put a value on it. It’s what will keep me in Brighton for as long as my life will let me. (Even if house prices never come down and we never have enough money to buy). Chris said to me after today’s race, he can never leave Brighton. I’m right here with him. Today was one big jolly. A supermassive BOSH family outing. 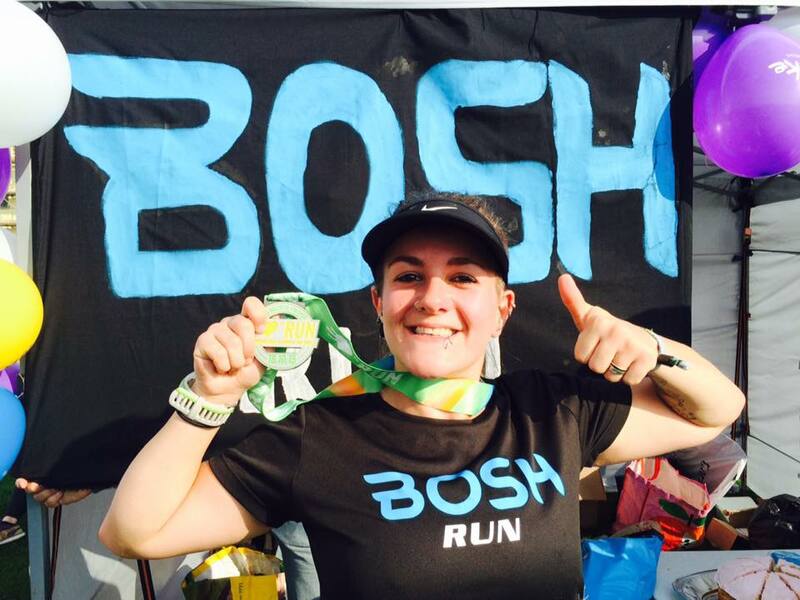 BOSH isn’t the only community I’m part of – I’ve met so many wonderful people through BTRS, bfit, boxing, parkrun, cycling groups and more, and events like this bring everyone together like one big family Christmas. The fast, flat route of the Bright10 steers refreshingly clear of the famous Madeira Drive, and instead takes over Hove Lawns to host the (brilliantly equipped) race village and start/finish line. As the starting gun went off this morning I was busy fannying about with my earphones but I’m so glad I put them away. I ended up running a comfy but steady pace gossiping with friends the whole way round. Friends on the sidelines shouted into megaphones to ‘get on with it and stop gassing’, but I was quite happy with the distraction. Another perk of friends on the sidelines – free photos! We stuck around 9min30/miles for the first half and when I mentioned I was well on course for a 10 mile PB at around seven miles, they picked up the pace and pushed me on. This is why running with other people is great. I would never have pushed as hard had I been on my own, probably deaf to the awesome atmosphere and sideline support from Leftfield pumping through my earphones. I wanted to start slow and build up for a strong finish and the splits tell exactly that story. What they don’t tell you, though, is that the last mile was punctuated with me hyperventilating, ‘it’s too fast’, ‘this is fast for me’, ‘this is more than threshold pace’. “That bloke in the yellow top – that’s where we’re going”, I was told. “Then the girl ahead in pink”. It’s funny how you can find just that little bit extra when someone’s pushing you to dig deep. We came in at 1hr32 on my Garmin (not sure on chip time yet), about eight minutes faster than I thought I was capable of, with a nice strong finish. Having never raced 10 miles it was an unknown distance, and now it’s done, my dream of a sub-2 half at Brighton Half in February (another amazing party race) seems more than achievable. I won entry to this race through BOSH earlier in the year so not only do I have friends to thank for the atmosphere, support, and finish-line cake, I have them to thank for the entry too. Would I pay for it next year, even though I run the seafront every week? Definitely. You wouldn’t not go to a party all your friends were at, would you? And sign up to the Bright10 next year to join the party! 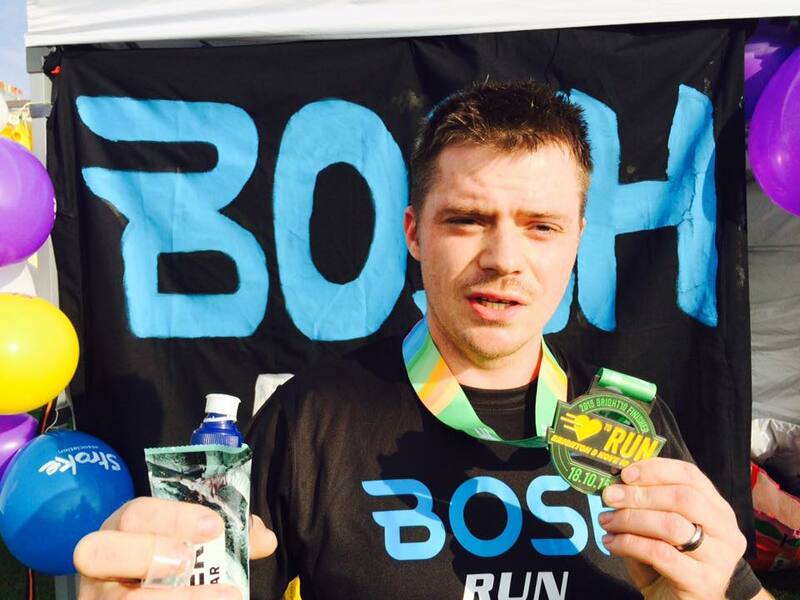 What makes running special for you? Do you run alone or with others?